Orb poses as he watches the other horses on Wednesday morning. Wednesday morning bright, sunny at Churchill Downs, and although it was cool at first it has warmed up nicely by the time the Kentucky Derby horses came out. All of the Derby horses on the grounds, except Lines of Battle who is in quarantine, and a few of the Oaks fillies came out at their special private workout session at 8:30 after the break. Below are photos for 18 Derby horses and 6 Oaks fillies from this morning on the track. Full barn notes for today are available here. 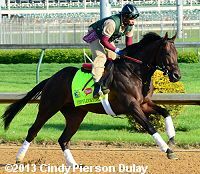 Tuesday Kentucky Derby Photos - Photos of and notes for 14 Derby horses and 6 Oaks fillies from Tuesday morning. 2013 Kentucky Oaks Entries - A field of 11 was entered with Dreaming of Julia a narrow favorite at 3-1. Top Kentucky Derby Contenders - All the top horses with full profiles including photos, past performances, and more. Derby Weather Forecasts - right now it looks like it will be cool and rainy, but we can hope that changes. Since there are 4 horses that didn't appear yesterday, I put them first then the rest in alphabetical order. First are the Kentucky Derby horses followed by the Kentucky Oaks fillies. Click the small photo to see a larger version. Mylute visited the track during the Derby and Oaks training session � deviating from his usual 5:45 a.m. routine � so he could school in the starting gate. With Derby jockey Rosie Napravnik watching intently from the half-mile gap, the Louisiana Derby (G2) runner-up jogged and galloped under exercise rider Maurice Sanchez. Orb returned to the racetrack Wednesday morning and jogged once around the track under exercise rider Jennifer Patterson. The son of Malibu Moon, who walked the shedrow Tuesday after breezing a half-mile in :47.89 Monday, was scheduled to school in the paddock during Wednesday's first race. Right: Orb protests his bath by kicking the bucket out of his groom's hand. Look at the larger version and you can see it flying. Oxbow had an easy jog this morning. Trainer D. Wayne Lukas, participating in his 27th Derby since 1981, said that he doesn't see an overwhelming standout. "The reality of it is, it's not an easy spot for anybody," Lukas said after watching Calumet Farm's Oxbow and Willis Horton's Will Take Charge jog Wednesday morning. "I think it's pretty wide-open, like everybody's telling you. I don't think we've got Secretariat in this bunch, even Seattle Slew. So, I think it's going to boil to trip and the pace and a lot of other things. I'm comfortable with where I'm at with my horses. If they're good enough, we'll find out, but I'm comfortable." Will Take Charge had an easy jog today. His trainer D. Wayne Lukas is comfortable with his jockeys, both veterans. Much has been made this week about his relationship with Gary Stevens, Oxbow's jockey, who is back at the Derby after coming out of retirement. But Lukas said he also connects well with Jon Court, who rode Oxbow twice this year and will be riding Will Take Charge for the first time. "I started using Jon, and we had good chemistry together," Lukas said. "I think sometimes when you get these rider/trainer relationships, there seems to be a certain karma. You fit. You get a line of communication or whatever. But Jon started riding real well for us. Of course, this is a home track for him anyway." 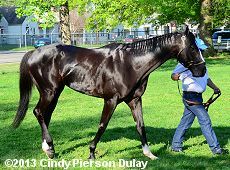 Black Onyx galloped a little more than 1 1/2 miles under exercise rider Aurelio Gomez during the Derby and Oaks training session and came back looking "tremendous," according to trainer Kelly Breen. The Spiral Stakes (G3) winner has rapidly come into his own since changing barns in January and Breen has seen this kind of progress with Rock Hard Ten colts before. "They start putting on weight and it's like a kid going through puberty," he said. "You see it right in front of your eyes and it happens in a matter of weeks. You really can see something change and hopefully it's not an awkward growth spurt. You see some horses that come into their own from two to three. It looks visually like he's blossoming and hopefully he runs the way that he looks." Charming Kitten went out for a gallop with the other four Todd Pletcher Derby horses, ridden by Patti Krotenko. When their business was completed shortly thereafter, Pletcher � who had gone to front side to observe their movements up close, reported that all was well with his one-quarter of the field for Kentucky Derby 139. "They all did the exact same things," Pletcher said. "They all galloped a mile and three-eighths and they all stood in the starting gate. Everyone did well." Falling Sky stood in the starting gate and galloped 1 3/8 miles under Cassie Garcea Wednesday morning at Churchill Downs. Frac Daddy had an easy gallop during the Derby and Oaks session this morning with his regular exercise rider Hugo Garcia aboard. "We full-galloped Frac Daddy from the three-sixteenths pole," trainer Ken McPeek said. "That's been his routine. He seems to want to gallop a long way and the further he gallops the better he seems to do. 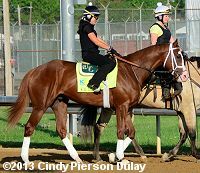 Goldencents went trackside for 8:30 at the start of the special Derby/Oaks training period. The tall bay was handled by regular exercise rider Jonny Garcia, who proceeded to take the Santa Anita Derby (G1) winner through a bit of backtracking before going through a strong mile and a quarter gallop around the track. Golden Soul galloped Wednesday under exercise rider Emerson Chavez. Between races Tuesday afternoon, Golden Soul schooled in the paddock. "It went well," Stewart said. "He got a little touch warm, but he settled down. It was hot, but he cooled down. They've got those fans in the paddock, so it looked like it helped a lot of them out, so it was good." Itsmyluckyday stood in the starting gate and galloped 1 3/4 miles under exercise rider Peter Shelton Wednesday morning at Churchill Downs. Java's War had an easy gallop during the Derby and Oaks session this morning with regular exercise rider Marvin Abrego aboard. "We wanted to shorten up on Java today. He jogged a mile and galloped a mile-and-a-quarter. I think we're going to try to gear him down. He shows a lot of energy when he's had a light day going into races and works so we're probably going to go lighter on him into the race." trainer Ken McPeek said. Normandy Invasion had a routine 1 1/2 miles gallop Wednesday morning during the time reserved at 8:30 a.m. for Derby and Oaks horses. After the Tapit colt returned to the barn, owner Rick Porter explained that he decided to use the name Normandy Invasion because he had been moved by visit in 1994 to the site of the D-Day assault on the beaches of France in World World II. "I went there for the 50th anniversary and was really inspired by everything I saw there," Porter said. "If you're ever near there, you've got to go to Normandy. You've got to put that on your bucket list." Overanalyze came out for a gallop under exercise rider Obed Perez with the other four Todd Pletcher Derby horses. When their business was completed shortly thereafter, Pletcher � who had gone to front side to observe their movements up close, reported that all was well with his one-quarter of the field for Kentucky Derby 139. Palace Malice came out for a gallop under exercise rider Jake Nelson with the other four Todd Pletcher Derby horses. When their business was completed shortly thereafter, Pletcher � who had gone to front side to observe their movements up close, reported that all was well with his one-quarter of the field for Kentucky Derby 139. Revolutionary came out for a gallop under exercise rider Nick Bush with the other four Todd Pletcher Derby horses. When their business was completed shortly thereafter, Pletcher � who had gone to front side to observe their movements up close, reported that all was well with his one-quarter of the field for Kentucky Derby 139. Verrazano came out for a gallop under exercise rider Humberto Zamora with the other four Todd Pletcher Derby horses. When their business was completed shortly thereafter, Pletcher � who had gone to front side to observe their movements up close, reported that all was well with his one-quarter of the field for Kentucky Derby 139. Vyjack galloped 1 1/2 miles under trainer Rudy Rodriguez Wednesday morning. Although this is owner David Wilkenfeld's first Derby starter, he said he isn't having any trouble handling the activity around America's biggest race. "I've been here with a friend before, so I have a little experience," Wilkenfeld said. "I don't find it overwhelming. I'm from New York. There's a lot going on there. I'm used to it." Beholder went out for a mile and one-half gallop Wednesday morning during the special Derby/Oaks training period following Churchill Downs renovation break. Jockey-turned-exercise rider David Nuesch did the driving on the bay daughter of Henny Hughes as trainer Richard Mandella looked on. Close Hatches looked impressive as she visited the paddock and galloped 1 3/8 miles. With the scratch of Flashy Gray, who had drawn post No. 10, outside filly Close Hatches will now get to move in one spot in the starting gate. "You don't know whether it's good or bad, I guess," Mott said of the outside draw. "There are advantages and disadvantages. You like to be on the outside and if the field separates itself you can tuck in a little bit. Obviously you don't want to be 10-wide around the turn." 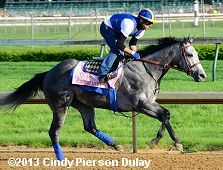 Flashy Gray visited the paddock before galloping 1 3/8 miles from the seven-eighths pole to the half-mile pole, but later in the morning was scratched from the Kentucky Oaks. Daily Racing Form reported the filly has suffered a foot bruise. Midnight Lucky galloped 1 1/2 miles Wednesday morning. Pure Fun galloped one mile during the Oaks and Derby session under exercise rider Jose Cano. Seaneen Girl galloped a mile and a half Wednesday under exercise rider Edward "Rocky" Seely. "Wonderful," Seely said. "She came out of her work (Monday) in very, very good shape. She's going as good as she's been going."